Each year come December, the Winter Meetings begin and the hot stove really kicks into high gear. The Winter Meetings are where the bulk of each team’s free agent and trade work gets done each offseason. This year those meetings will occur between December 7th and December 10th in Nashville, Tennessee. There is sure to be a lot of action at this year’s winter meetings, with a slower than usual beginning to the offseason up until this point. Before we get too far ahead of ourselves with next weeks winter meetings, there is another important event on the baseball calendar scheduled for this week. The non-tender deadline. Teams must decide by Wednesday, December 2nd, which arbitration eligible players they will extend a contract to for next season and which players they will non-tender. Basically, non-tendering a player means that the team does not see that player being worth a potential arbitration raise, so they allow the player to test free agency. Almost every year, there are certain players who go from being non-tendered, to ending up a vital part of another team’s success. The most recent example of this was when the Mets non-tendered Justin Turner, who went on to have two very successful seasons after joining the Los Angeles Dodgers. While there are quite a few players who could end up being non-tendered this year, there aren’t a lot that jump out as huge successes to the level of Justin Turner. One likely non-tender candidate, and perhaps the most interesting one of all, is Pittsburgh Pirates first baseman Pedro Alvarez. 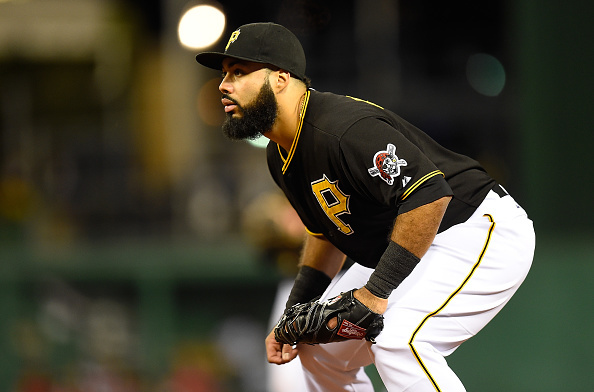 It appears pretty clear that Pedro Alvarez has worn out his welcome in Pittsburgh, with both the team, and Alvarez, interested in a change of scenery for the 28-year-old first baseman. With a projected arbitration salary of over $8 million for 2016, the small budget Pirates are likely doing everything in their power to move on from the slugger. Despite the desire on the Pirates part to rid themselves of Alvarez and his increasing salary, trade market doesn’t seem too robust for the first baseman. Coming off a 2015 season in which he slashed .243/.318/.469 with a 0.2 WAR, all while playing well below average at first base, it appears Alvarez’s value going forward is as nothing more than a designated hitter. Alvarez does not hit for average, struggles to get on base, plays poor defense, and strikes out a lot. At this point, the only thing he does with some success is hit home runs, with 27 home runs in 2015. If the Pirates are unable to find a fit for Alvarez in the coming days, it makes a lot more sense for the team to not bring him back for next year and use that $8 million dollar savings elsewhere. The team could even bring in a cheaper veteran option at first base as a stop-gap until youngster Josh Bell is ready for a Major League call up. One interesting option is a reunion with Justin Morneau, who could be a platoon partner with Michael Morse until Bell is ready. Either way it makes more sense for the Pirates to use that money elsewhere, then to trudge on with Alvarez on the roster next season.